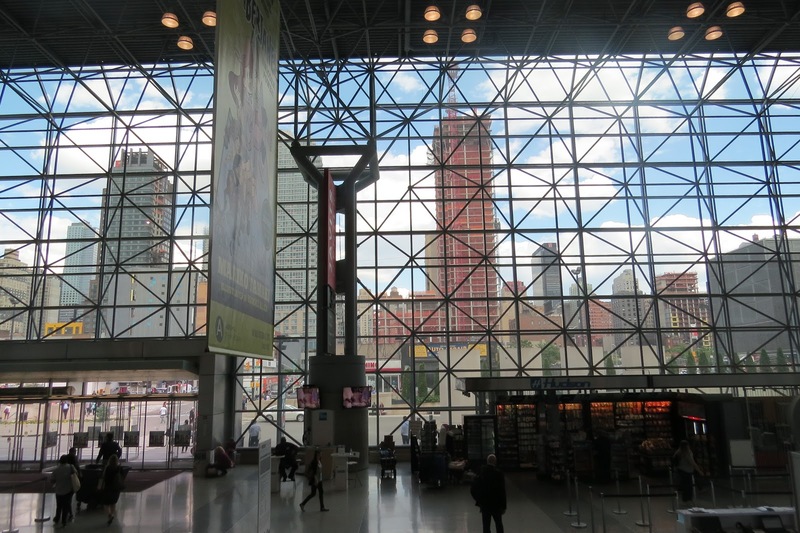 For the last two years, I have been privileged to serve as an onsite correspondent for Armchair BookExpo. I've gone to Chicago and New York. I've met oodles and oodles of authors and I've seen oodles and oodles of wonderful new books. For a variety of reasons, Armchair BookExpo is no more. And for one (HUGE!) reason, I am not at BookExpo this year....I am in Italy celebrating the the retirement of my husband and me as well as our 40th wedding anniversary. But there's no reason I can't visit Italy and go to BookExpo at the same time....isn't that the wonder of the written word? Deb, one of our on-site correspondents, checking in again from Book Expo! The Silent Art Auction at BookExpo was held the first night of the event. Over 125 illustrators donated to this auction. 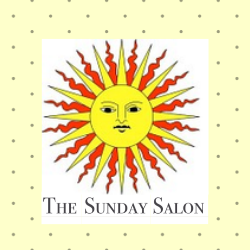 Proceeds from the auction benefit American Booksellers for Free Expression and Every Child a Reader. Some very well known children's picture book illustrators donated a sketch or a drawing or an original piece to the auction. It was fun to walk around the auction and see how many I recognized. How many can you recognize? There is always something going on at BookExpo! 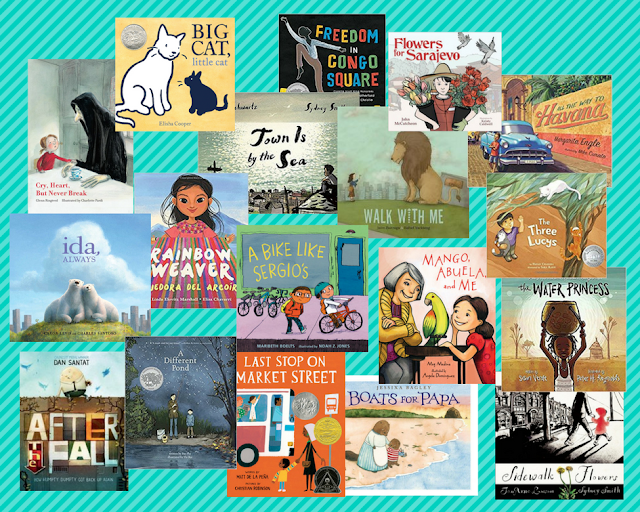 Here is the answer key if you'd like to check yourself: Nick Bruel (Bad Kitty); Brian Floca; David Soman (Ladybug Girl); Herve Tullet (Press Here); Lita Judge (Flight School); LeUyen Pham (Princess in Black); Dan Santat (After the Fall, Beekle); Marla Frazee; Chris Gall; Paul O. Zelinsky. I'm not at BookExpo this year. I'm in Italy. A difficult decision: Should I go to BookExpo or Italy this year? 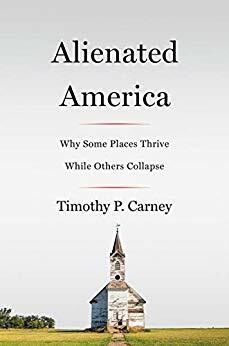 I'm a huge fan of BookExpo, so while I'm traipsing, gallivanting, cavorting around Italy, I'll share some BookExpo from 2017. If you are there, enjoy! The most awful of bookish worlds is the world that was or is or could be. Many times I've been in the pages of a book and I've wished heartily that I'd be able to close the book and leave the story. But the most awful of book-ish worlds seem to linger with you. Hi, everyone! 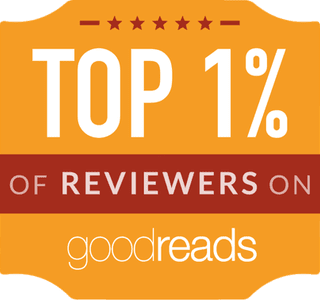 I'm Deb Nance and you will usually find me typing away at my little blog, Readerbuzz. But this week I am living every book fantatic's dream: I am at Book Expo in New York City. Last year was my first time to visit Book Expo. It was held in Chicago. I loved it, but people told me, "Just wait. It's even more amazing when it is held on its home stomping ground, NYC." Today I walked around the Javits Convention Center and looked at book ads. There were ads everywhere. And they were all for books. Ads on the door when you walk in. Book ads on the billboard just outside the convention center. How about this?! Ads for books on the stairs! 'We want every kid to say, "Please give me another book!"' Oh, man, do we ever! LIVE FROM BEA 2016: Good-bye BEA! 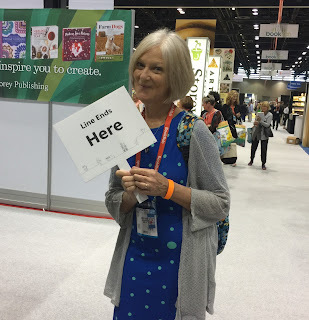 Deb from Readerbuzz closes her time in Chicago for Book Expo America! All good things must come to an end. Sigh. I am headed home to Houston, Texas early Saturday morning. I'm so tired I don't even know how many books I have. I had to mail home eighty-eight pounds of books but that doesn't count the suitcase of books I collected yesterday. Maybe you can do the math, 'cause I'm too tired. But it's a good tired, a happy tired. The kind of tired you feel when you've been to the Disneyworld of Books. And that's BEA. I'll be back, BEA. I'll be back next year. I saw the bowl first. It was a bowl of tattoos. Now I have resisted getting a tattoo until now. 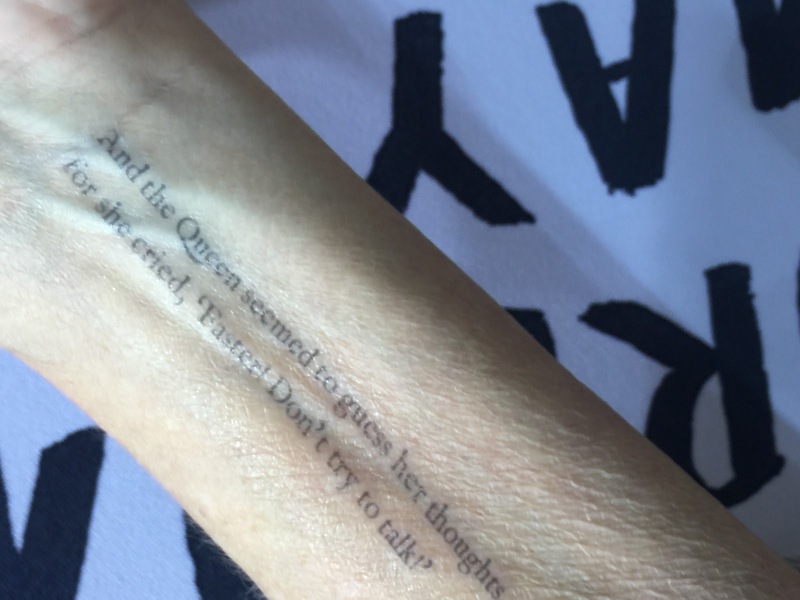 But, by golly, these were literary tattoos. Bonus points: Can you guess what book this quote is in? It's not just a tattoo. It's not just a literary tattoo. It's a tattoo chain. They are trying to write the entire book of...yes, you guessed it---Alice in Wonderland---in tattoos! Welcome to our special feature where our on-site correspondents bring the Armchair BEA crew highlights from Chicago! This is our very first look in pictures at Book Expo America and BEA Bloggers Conference thanks to Deb of Readerbuzz. Enjoy! It's been on my bucket list for a long time, and now I'm finally here. BEA. Yes, Book Expo America, baby. I'm here and the first thing I want to tell you is that it's all true. BEA is amazing. A-M-A-Z-I-N-G! What's the first thing I saw as I walked into McCormick Convention Center in Chicago? Ads. But not ads for Budweiser or the next superhero movie. These ads are for...wait for it...books! 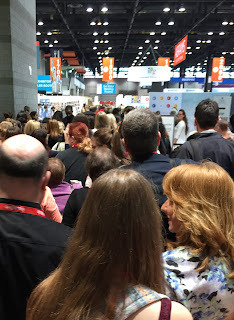 I am spending Wednesday at the BEA Book Bloggers Conference. Erin Loechner delivered the keynote. She is a ten-year blogging veteran and did she ever have some wisdom to share?! Erin shared this little tidbit of wisdom that I think every book blogger could use. She said when she receives negative feedback, she asks herself one question: Do I believe this? If she believes it, she says thank you and grows. If she doesn't, she says thank you and goes. Doesn't that take the kick out of those negative comments that occasionally come to rest at our blogs and so disturb our days. Erin also quoted the tour guide who led her group on a hike in the Andes: "We go up together, and we go down together." That's our blogging community, she told us. We stick together and go through it all, good and bad, together. I spent the morning at two great blogging panels: Growing Your Social Media Presence and Creative Content: From Ideas to Tools. Here's what I took away from Growing Your Social Media Presence, via Andye Eppes at readingteen.net: Be kind. Remember there is another person on the other side of the computer screen. Build those connections with your readers. And moderator Meg Morley at Cuddlebuggery.com during Creative Content reminded us to ask ourselves:Am I having fun? Then there was lunch and it was time to hit the exhibit hall. It was a mad rush into the hall. Or should I say, it was a mad rush to get at the books. Some publishers' booth staff took their jobs very, very seriously. This staff member was guarding her books with her life until the designated release time. Happily, there were all the usual suspects. Harper Collins. Penguin Random House. Macmillan. Scholastic. And many, many more. Anyone who publishes books has a corner here. The afternoon at the book blogger conference brought Blogger Table Talk. Moving from table to table, bloggers shared their experiences, their questions, their thoughts about diversity in books, keeping up with Twitter, book tours, memes, blogger burnout, and working with publishers. Lots of great ideas shared and lots of blogger bonding. And what a finish! The final event of the day was a blogging celebration with beer, wine, and popcorn. No, we are not there yet, but we leave this week. I'm wildly and imperfectly trying to pack and bring all my library things home from school and get things ready here, so I won't be around the blogosphere much today or in upcoming days, but I promise to visit everyone who stops in at Readerbuzz in my absence when I return. In lieu of new posts, I'll be posting 2017 and 2016 BookExpo for the next two weeks. I have never posted them on my blog, so I thought it would be fun to run them here while I'm off in Italy. I've now tried three different for pizza from three different cookbooks. 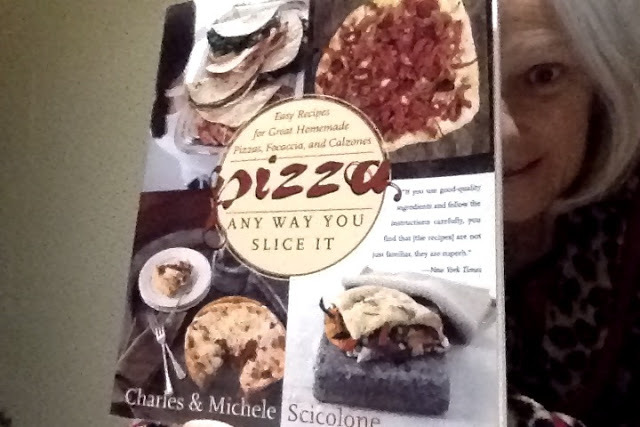 This one would probably appeal the most to American readers accustomed to American pizza. Sprinkle the yeast over the water and let stand for 1 minute, or until the yeast is creamy. Stir until the yeast dissolves. In a large bowl, combine the cake flour, 2 1/2 cups of the all purpose flour, and the salt. Add the yeast mixture and stir until a soft dough forms. Turn the dough out onto a lightly floured surface and knead, adding more flour if necessary, until smooth and elastic, about 10 minutes. Lightly coat another large bowl with oil. Place the dough in the bowl, turning it to oil the top. Cover with plastic wrap and place in a warm, draft free place and let rise until doubled in bulk; about 1 1/2 hours. Flatten the dough with your fist. Cut the dough into 2 to 4 pieces and shape the pieces into balls. Dust the tops with flour. Place the balls on a floured surface and cover each with plastic wrap, allowing room for the dough to expand. Let rise 60 to 90 minutes, or until doubled. Thirty to sixty minutes before baking the pizzas, place a baking stone or unglazed quarry tiles on a rack in the lowest level of the oven. Turn on the oven to the maximum temperature, 500 to 550 degrees F.
Shape and bake pizzas in desired fashion. None of the pizza recipes I've tried are difficult. None of them require odd, difficult-to-find ingredients. None of them take a lot of time to make. But somehow that's the perception of making pizza yourself. I encourage you to try handmade pizza. Jump in. You will see it is much easier and more delicious than what you buy. 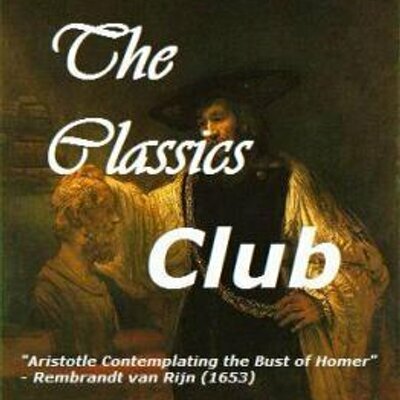 Reading is fun, I thought when I was young. Reading takes you on extraordinary adventures, it allows you to visit amazing places, and it lets you live the lives of wonderful people. Except when it doesn't. As I discovered when I became older. But there is also a joy in reading difficult stories, in reading about difficult places, in reading about difficult lives. When I was a child, Pollyanna and Heidi and Anne of Green Gables were the only stories I read about difficult lives. The main characters all had cheery personalities and they all overcame their difficulties with the sheer force of cheeriness.